David Ditch is a research assistant in the Grover M. Hermann Center for the Federal Budget at The Heritage Foundation. The holiday season is a good time to reflect on what took place over the last year—to reflect on victories, defeats, and to consider whether our efforts have moved us forward. When it comes to looking after the nation’s checkbook, the lackluster efforts of politicians in 2018 have decidedly moved us backward. Here are five ways we are worse off fiscally after 2018. 1. Interest on the debt was $371 billion. According to the Congressional Budget Office, simply servicing the national debt this year cost over $1,100 per person. If that wasn’t bad enough, interest on the debt is now the fastest-growing spending category, having increased 20 percent in a single year and 31 percent over the last two years. Unlike other types of spending that can be controlled directly by legislators, interest rates are dependent on what rate of return market buyers demand for U.S. treasury bonds. Due to the enormous size of the debt, even tiny increases in interest rates cost Americans tens of billions. 2. The deficit climbed to $779 billion. 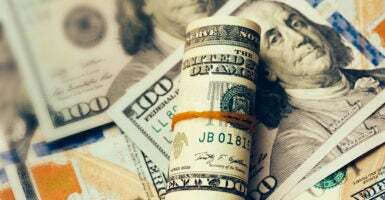 The gap between taxing and spending in 2018 increased by $113 billion from the sinister figure of $666 billion in 2017. With the U.S. population around 329 million, that works out to over $2,300 for every person. Since federal revenue was a mind-boggling $3.3 trillion (over $10,000 per person), the problem is hardly that taxes are too low. 3. 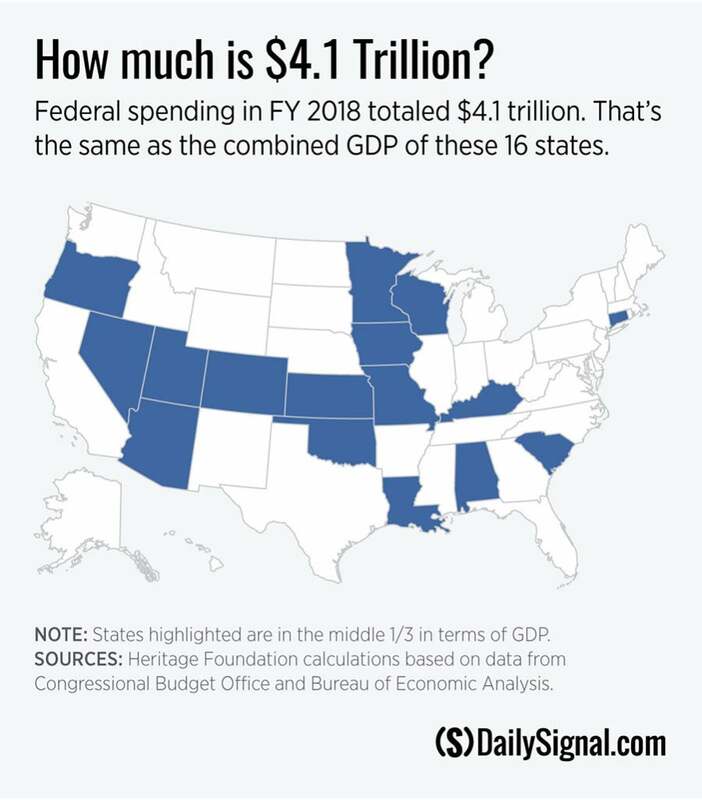 Total net federal spending hit $4.1 trillion. When discussing numbers of this size, it is necessary to take a step back. A million dollars is a lot of money. A trillion is a million multiplied by a million. Thus, the federal government spent over $4 million million last year, or $4,108,000,000,000. As if that was not enough, the $4.1 trillion figure is only “net” spending. This ignores fees collected by federal agencies and offsetting receipts such as Medicare premiums, which add up to hundreds of billions more each year. The federal government is spending too much, at a high cost to the American people. 4. The national debt is now $21.8 trillion. It was just last year that the debt exceeded $20 trillion for the first time. Based on the most recent data, the debt burden on every single American is now $66,350. That is a heavy lift for a typical adult earner. The share of the debt per American exceeds their share of annual personal income by over $13,000. Even worse, it is an exceptionally unfair burden to place on children who have never had a chance to vote, and yet will have to pay for interest on that debt throughout their lives. 5. It only gets worse from here. There are times when a nation simply cannot avoid running a deficit, such as a war of survival or a sharp recession. That is not the case as we head into 2019. Current deficits are based on politically-motivated choices rather than unfortunate circumstances. The country is neither entangled in nor actively recovering from a vast military effort such as World War II (which was the last time U.S. debt levels were as high as today), the economy is booming, and there are hundreds of well-known proposals to bring the deficit under control. If anything, this would be a good time to pay down the debt rather than add to it. In April, the Congressional Budget Office estimated that the fiscal year 2019 deficit would be nearly $1 trillion. With legislation that has passed since then or is expected to be passed, it seems as if Congress is actively seeking to drive the deficit above that 13-digit amount as fast as possible. Even worse, the deficit is projected to climb higher every year after that. The driving factor behind those deficits is spending. While tax revenue is expected to be within a historically normal range, spending as a share of the economy will increase to levels that have only been seen during the peak of World War II and the depths of the Great Recession. In turn, the largest reason why spending is expected to skyrocket is found in three programs: Social Security, Medicare, and Medicaid. The retirement of the baby boomer generation causes the Social Security and Medicare rolls and costs to swell, while the passage of Obamacare expanded the number of people who receive Medicaid and other health care subsidies. Despite assurances from politicians that Medicare’s and Social Security’s benefits are covered by “trust funds,” the reality is that these programs are on their way to bankruptcy and the so-called trust funds contain nothing but IOUs. By implementing targeted changes now, these programs can be made economically sustainable while still protecting vulnerable seniors. The longer we wait to begin the reform process, the harder it will be to make the math work. If Congress and President Donald Trump continue to avoid the problem, they will put seniors at risk and pass the bill to America’s children. Hundreds of millions of Americans will work hard and make difficult choices in 2019. They deserve the same effort from their political representatives.